I have been knitting like a mad woman. Ok not really, but I feel like I have. 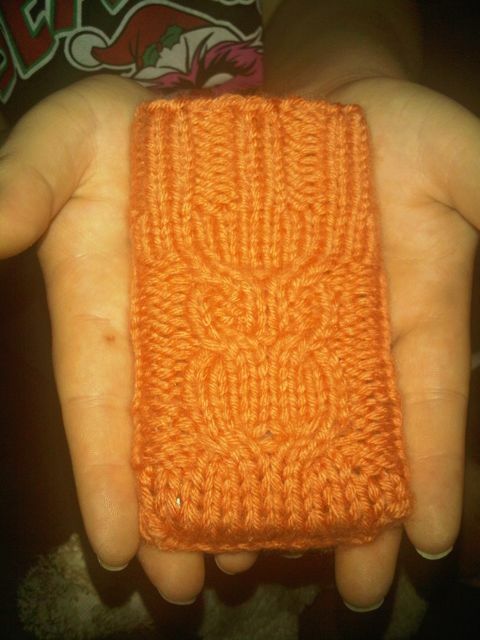 My cover for my iPhone broke the other day and I decided that it needed something to keep it safe so I knit a cozy for it. I can’t link on the wordpress app apparently but you can check out my Ravelry (woolendreams) for the link to the pattern. 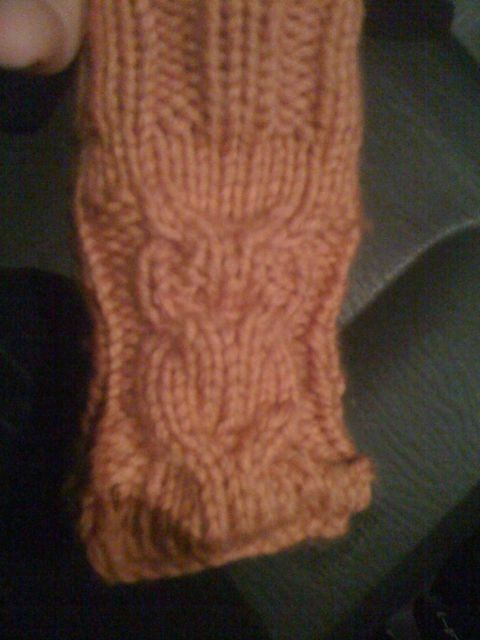 The only problem I had with the pattern was that there was no guage guide and since I was using a different weight yarn that what the pattern called for I ended up knitting it 3 times. Even so it took me less than a day to complete. I used Rowan Cashsoft. I believe I used the DK weight. I love it. I don’t seem to know where my button stash is (or if I still have buttons) and I was going to do French knots for the owl’s eyes, but I kind of like it without the eyes. I may go back later and add eyes. I also have a Herringbone sock on the needles right now. I am not pleased with the yarn that I chose. I am down to only two sock yarns in my stash. I have some handspun that I might end up using later, but we will see. Anyway both of my commercial sock yarns are too busy and I feel like the stitches are getting lost in the color. The bamboo yarn was WAY too busy and the black, red and white yarn is not quite as bad. It’s a self striping yarn. I love the colors in it. It makes two stripes, one is a dark black and red stripe and the other is white and black and speckled looking. Basically the darker stripe would be great for the stitches but the color is just too dark. The lighter stripe is just so busy that you can’t tell what is going on. Still it is better than the bamboo which is blue, light and dark brown. It is gorgeous and reminds me of the beach, but you can’t tell what is going on at all. I forget what it’s like to knit on size 1 needles. My hands are paying for it. I also haven’t used dpns in a long time. I need to enhance my needle stash badly. I prefer working on 2 circs to dpns, but I don’t have size 1 in circs. It’s also been a while since I have knit on metal needles. Yuck. I might put this sock on a waste yarn and try out another yarn. I have about 2 1/2 inches knit so if I decide to stick with this yarn, I don’t want that work to go down the drain. I really like the herringbone pattern. I have never done one before and it is exciting enought that I am really enjoying it, but easy enough that I don’t have to focus too much. As far as spinning is concerned, there isn’t much to tell. I finished plying the pink yarn finally. I couldn’t decide on plying it or leaving it as singles. Overall I am just not real happy with the yarn. Not my best work. It is pretty, but it is just not what I wanted out of it. I am ready to start spinning some other fiber that I got from a friend. The colors are pretty and i am just really excited for it. I need to order more fiber, but that’s on the back burner for a while. I did not get to go to stitches south. It was such a hard decision to make. With me not having a job, we just don’t have any money left over and in the jeep a trip to Atlanta is an entire tank of gas. We had other things that we needed and only enough money for about a tank of gas. I am trying to focus my attention right now on job hunting. We have made a deal with child support so that we can get by until I find a job. The best part about this is that is allowing us to buy a second car. It isn’t much to look at, but it will help with job hunting. With only having one car and Jim working 6-7 12 hour shifts a week, it is so hard to get us both from point a to point b. Now I also have the freedom to work further away from home if I need to. We haven’t had 2 cars since before we got married. And since it is very used and the guy needs to get rid of it, the price is very good and we won’t be stuck in a car payment. This relieves a ton of stress on me. It also adds some stress because that means insurance, gas and maintenance on two cars instead of one. Oh well. At least we are finally to a point that we are caught up on everything. It’s been rough the last several weeks. Now I just have to find the right job. I really don’t want to have to take a job I don’t want to hold me over, but if I don’t find something soon, I won’t have a choice.